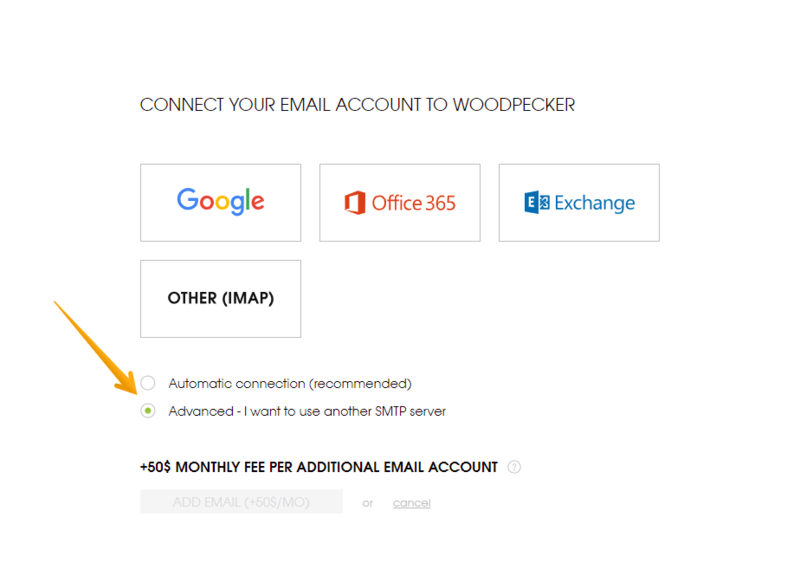 Woodpecker has native, one-click integration with Google's Gmail, and Microsoft's Office 365 and Exchange. For any other email service provider, you should select “Other (IMAP)”. The setup will not be long either way! Note that when you select one of the available options, you will be informed about the sending limits for this provider. The default limit in Woodpecker will be set according to your choice. You can change it later in Settings. Next, select "Advanced - I want to use another SMTP server", and click "ADD EMAIL". Type in your email address or login, password, ports for the IMAP and SMTP for this account. Trouble finding it? Look for it in the settings of your mailbox, or check your server's help page. 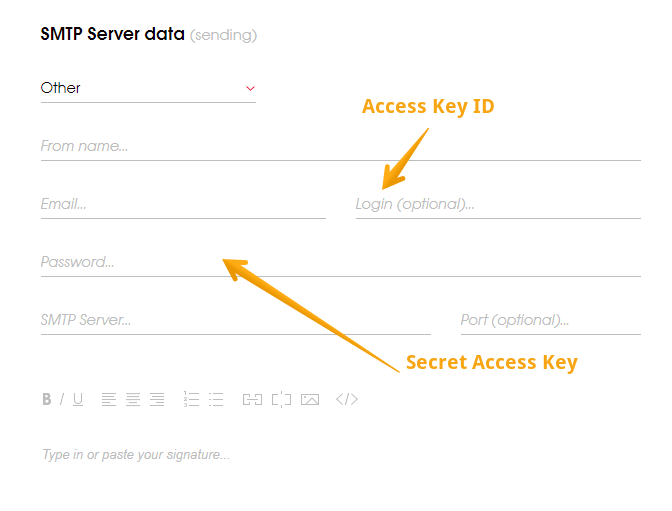 Add Access Key ID in the "Login (optional) section" and the Secret Access Key as the "Password" when connecting Amazon SES. Not sure how to find your Access Key ID and Secret Access Key? Learn more about it here. You can set the sender's name that will be visible to your recipients. You can also set a signature that will be attached to the emails you send. You can skip this step for now and edit your From Name and Signature later by clicking ‘set it later in Settings’. Click ‘Connect’ / ‘Add’ and wait until Woodpecker finishes the configuration. Note: Woodpecker may connect your email address conditionally Check what that means here. In case of any other issues with connection have a look here. Q: How can I set up SPF and DKIM on my DNS server? Q: What SPF should I add to the DNS? A: Please add: "v=spf1 include:amazonses.com ~all"